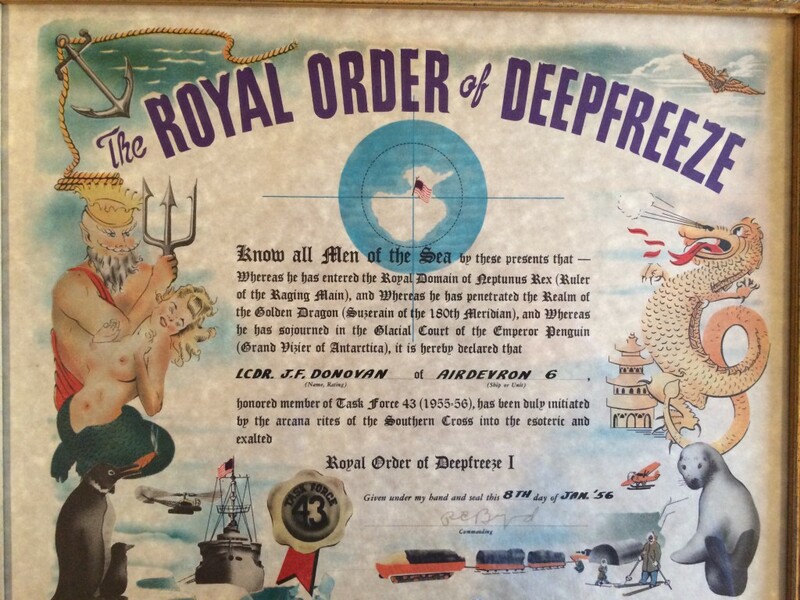 Operation Deep Freeze I was the codename for a series of scientific expeditions to Antarctica in 1955-56. The impetus behind these expeditions was the International Geophysical Year 1957-58. IGY, as it was known, was a collaboration effort between forty nations to carry out earth science studies from the North Pole to the South Pole and at points in between. The United States, along with Great Britain, France, Japan, Norway, Chile, Argentina, and the U.S.S.R agreed to go the South Pole–the least explored area on Earth. Their goal: to advance world knowledge of Antarctic hydrography and weather systems, glacial movements, and marine life. The U.S. Navy was charged with supporting the U.S. scientists for their portion of the IGY studies. The U.S. Navy already had a record of earlier exploration in Antarctica. As early as 1839, Captain Charles Wilkes led the first U.S. Naval expedition into Antarctic waters. In 1929, Admiral Richard E. Byrd established a naval base at Little America I, led an expedition to explore further inland, and conducted the first flight over the South Pole. From 1934-35, the second Byrd Expedition explored much further inland and also “wintered over.” The third Byrd Expedition in1940 charted the Ross Sea. After WWII, from 1946-47, Byrd was instrumental in the Navy’s Operation Highjump that charted most of the Antarctic coastline. In 1948 Commander Finn Ronne led an expedition that photographed over 450,000 square miles by air. Then, in 1954-55, the icebreaker U.S.S. Atka(AGB-3) made a scouting expedition for future landing sites and bays. Operation Deep Freeze I would prepare a permanent research station and pave the way for more exhaustive research in later Deep Freeze operations. The expedition transpired over the Antarctic summer of November 1955 to April 1956.